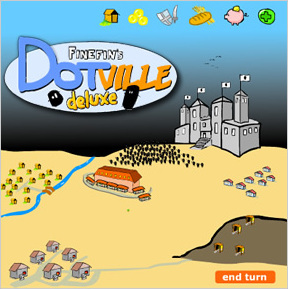 Dotville is a city-building Flash game along the lines of Civilization, but greatly simplified. You play the leader of a tribe of Dots (yeah, Dots) and must rise to the rank of Emperor in fifty turns, then defeat the evil empire of Squares. 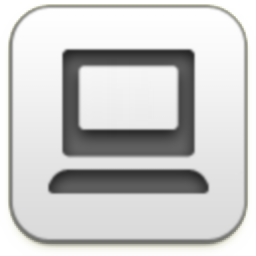 It was created by Finefin. Each turn corresponds to a year in your character's life and allows you to spend money building food-producing farms, money-producing markets, as well as your military industrial complex in the form of smiths and mines. Your people also have a happiness meter that goes down due to random events and hunger, but can be raised by investing in public works and fortifying your castle. In order to raise in rank—from a humble citizen to a hero, prince, king and then emperor—you must raise your fortress and the happiness of your citizens. It's simple, and yet somehow very complex. Intermittently, the Squares will try to raid you, but they can be beaten, even without an army, with a few deft moves in a Tic-Tac-Toe mini-game. The final battle, which occurs if you've become an emperor by the end of the game, is a Rock-Paper-Scissors mini-game where you wager troops to deduct from the enemy's total, or lose from your own. Random events occur throughout and can be frustrating, as a sudden punk demonstration can thwart your happiness level a few turns before the end causing you to lose the game for no apparent fault of your own. But, there's a way to play that lets you shrug off even the worst fortune. I don't want to ruin the experience, but reinvest your money in markets as often as possible, and you'll do ok.
Dotville is a flawed but fun attempt to bring city management gaming down to a ten minute experience. And if you've got a soft spot for basic geometric shapes with eyes, legs, and lives of their own, then you better play Dotville.